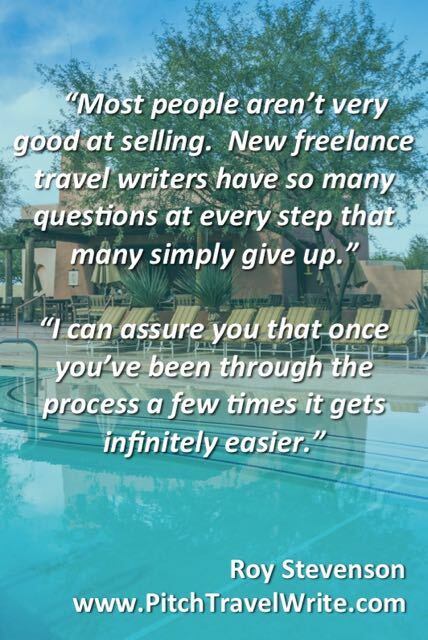 Understanding the sales process is the biggest hurdle for beginning freelance travel writers. What does it take to sell your travel articles? How do you find editors and publications to pitch? Why hasn’t the editor replied to my query letter? 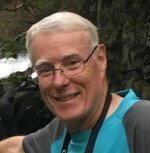 What do I need to do to get my article published? The questions come fast and furiously. Selling your travel articles can be a daunting task when you’re a novice. Most people aren’t very good at selling. And getting an article accepted by an editor is all about selling your story idea successfully. New writers have so many questions with every step that many of them simply give up. That’s how it is starting out. However, I can assure you that once you’ve been through the sales process a few times it gets infinitely easier. Things that took hours to do in the beginning will only take a fraction of the time later on. To talk about the sales process, you need to have something to sell. 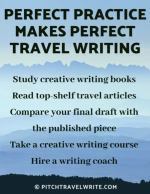 For travel writers that means you have some solid, viable story ideas to get started. Now what? In simplest terms, my sales process starts with pitching a story idea. Once I have an assignment, I travel to the destination. Finally I write the article. Pitch. Travel. Write. That’s the birds-eye view. Step 1. Do your research before you write your query letter. In my sales process, I don’t take a trip until I have an assignment. So once I target a destination and have a story idea, it’s time to do some research. The purpose of this step is to dig up some juicy facts to include in your email query letter. You want to show the editor that you know something about the topic and that you are qualified to write the article. Doing good research helps you with this step. Go online, read guidebooks, visit your local bookstore or library, and gather the information you need. Once you have some interesting and juicy facts, you're ready for the next step. Step 2. Who might want to buy your story? The next thing you need to do is give some careful thought to who will be interested in your idea. Who are your potential customers? For example, if you’re writing an article about a deep-sea fishing trip, fishing magazines will be the first things to go on your list. 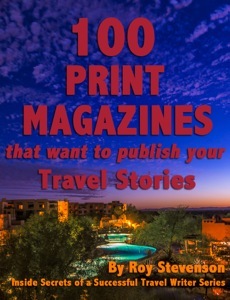 Then you might add some adventure sports or adventure travel magazines. Continue asking yourself “who else might be interested in buying this story idea?” until you run out of ideas. Step 3. Write your query letter. Your query letter, or "pitch" is a critical step in the sales process. It gives you the opportunity to describe your story idea to editors and explain why their readers will be interested in it. The query letter requests the opportunity to write your story for that publication. These days your query letter isn’t actually a "letter", it's an email. But it’s written like a letter, in a professional way. When you’re starting out, full, detailed query letters are required. The editors don’t know you and it gives them the opportunity to learn something about your writing abilities and what you can offer. Your query letter should explain your idea enough to intrigue the editor, and point out where the story might fit into the magazine. You'll need to address this clearly and concisely, without rambling on. Your query letter shows the editor that you've thought through the story and considered how it will fit with the magazine. It also gives you a chance to prove your writing skills enough to demonstrate that you can be trusted to write a good article and deliver it on time. Creating your own query letter templates helps make this process easier and more productive. As you can imagine, writing query letters is one of the most important tasks you will do. I've written a manual about query letters, The Complete Guide to Query Letters for Travel Writers. Besides telling you everything you need to know about writing query letters, it has 20 sample query letters that are real letters I used to get assignments. You can use these samples as a foundation to build your own templates - it will save you a bundle of time. Eventually, as you get more established, editors will get to know you and your work. Once you establish a solid, working relationship with an editor, you are usually able to make much shorter pitches. You won’t have to work as hard at selling your story ideas. This could take some time, especially if you’re a part-time writer. 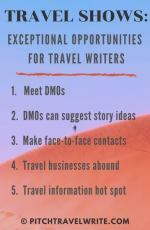 It may take one, two, or more years to establish your bylines and credentials as a professional and well-published travel writer. In the meantime, just keep building your bylines steadily and developing relationships with editors. Keep sending your pitches out, and accumulate those bylines in a nice variety of magazines and sub-genres. Step 4. Travel to your destination. 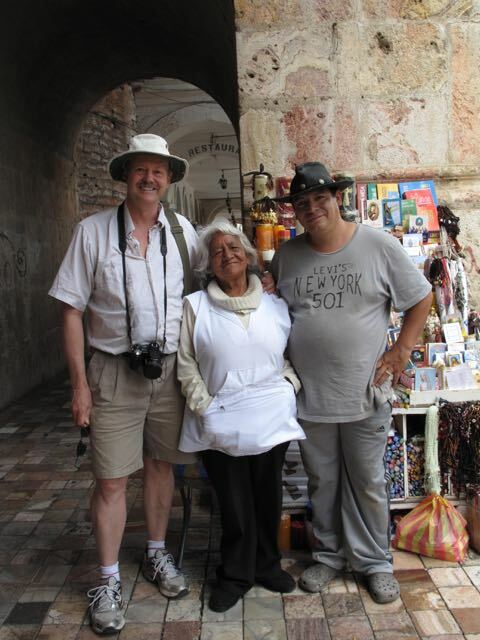 Here I am hanging out with a couple of the local shopkeepers selling religious items outside a church in Quito, Ecuador. When the editor accepts your story proposal it’s time to plan your visit to the destination. With your assignment in hand, contact the local tourist office for information, or to request assistance with your itinerary, accommodations, meals and entry to tourist attractions. I've written The Complete Guide to Landing Press Trips and Fam Tours for Travel Writers if you want to learn more about this process. Then, while you’re at the destination, gather more information. Pick up booklets and brochures. Interview experts and take good notes. All of these things will help you write a better article. And, don’t forget to take lots of photos to document your trip, and to accompany your article. It’s often easier to sell an article when you have a photo gallery to go with your story. Step 5. Write your travel article. Some journalists write the article while they're at their destination, but I rarely do this unless I’m working under a tight deadline. I take lots of notes and accumulate plenty of tourist brochures and literature while I'm there. I prefer to write the article once I'm back in my home office, where I can take the time to review my notes and create a well-written article. Write your article as soon as possible once you return from a trip. Waiting only makes things fuzzy in your mind - so write it while it’s still fresh. Make sure your articles are well-written and thoroughly edited before you submit them. Employ a professional editor if you need to, but I don't recommend asking your family or friends to do this. It can be a recipe for disaster. They might have worse writing and grammar skills than you, and may not be able to give you honest feedback because they like you and don't want to hurt your feelings. Having someone else review your story will save you a lot of re-writing from an editor. If you’re including a photo gallery, caption your photos. Then send your article and photos to the editor, preferably before the deadline. Repeat steps 1-5 of the sales process for your next story. You can be researching, preparing, pitching, and writing many stories simultaneously if you’re well organized. You don’t have to steer one story through the entire process before starting the process again with your next story idea. You want to be developing story ideas, writing query letters, and writing your articles at the same time. Keep lots of story ideas and pitches circulating while you continue to write your articles. You just need to be organized to do this successfully. Getting your story ideas accepted by editors and then published doesn’t have to be difficult, if you stick to these basic sales process steps. There's a home for most of your travel stories somewhere out there - and following this process with help you find it.